Atomic Power Review is proud to host the 154th Carnival of Nuclear Bloggers on this last Sunday of April, 2013. This great feature both promotes the top English-language pro-nuclear blogs, and (by way of the nature of its operation) gives the general reader a pointer at what the authors of these blogs (or administrators in some cases) feel were the outstanding items of the week. There's always a game here at Atomic Power Review when I do the Carnival; I show a photo from my vast archive of useless information and ask you to guess what it is. We've been having more reports of correct guesses of late - so let's hope that keeps up. For now, What is this? Clearly, this is a significant construction site. There is a river or stream outlet visible in the upper right quadrant of the photo and much more visibly a river along the top. We see a large concave structure of sorts being built here (click to enlarge!) and a very heavy reinforced wall next to it. I'll give a further hint: This photo is dated June 21, 1962. Yes -- of course this is nuclear related! The answer .. and much more .. to follow the Carnival. Civil Disobedience May Be Required to Overcome Illogical EPA Radiation Limits. Adams relates an exchange with an author of a recent popular article on LNT, and explains why he's adamant that the overly restrictive limits on radiation exposure be challenged and remove. Six Earth Day Facts. Facts about natural nuclear phenomena and the environment. Some of these facts might really surprise you. Nuclear Power and Carbon Emissions: Gail Marcus takes on some erroneous allegations about the carbon emissions from nuclear power at Nuke Power Talk. She notes that some of them have been floating around for a long time, and analyzes why they may be believed and why they are wrong. Since one of the benefits of nuclear power that the public most appreciates is their low carbon emissions, it is important to set the record straight. New EPA Guidelines for Response to Radioactivity Releases: The U.S. Environmental Protection Agency recently released draft standards and recommendations for response in the event of a large release of radioactive material into the environment. Jim Hopf assesses the current and proposed policies and their underlying assumptions - and finds them quite unwise and indefensible. The draft EPA guidelines are out for public comment, and Hopf urges readers to respond. Fukushima Showed No Radiation Health Consequences: Robert Hayes examines the fact that there haven't been reports of radiation injury as a result of the March, 2011 Fukushima accident, using UNSCEAR and WHO documents as support; he also briefly discusses low-dose effects. Day 72: The Grand Finale. Baker rounds up her grand European nuclear tour with a visit to AREVA's fuel reprocessing facility at La Hague. Her visit is accompanied by David Hess of the World Nuclear Association. The two give us a tour of the facility, with many details and interesting photos. A grand conclusion to the series! Meredith has two posts this Carnival. In "Shaffer knows about spent fuel - Alvarez talks about it," she presents details of anti-nuclear activist Robert Alvarez's visit to Vermont. At the date of the first post, only anti-nuclear "experts" were invited to testify at a legislative committee event on spent fuel. Later, colleague Howard Shaffer was in fact invited to testify; this led to a second post on the subject which is entitled "Shaffer to Testify - Cheerful Wednesday." Energy and work: saluting those who do the most work, and never stop—even for a second. As a weekend warrior, Steve Aplin thought he was pretty amazing doing intense workouts like hot yoga and crossfit—until he crunched the numbers and realized his personal best would be barely enough to keep a single 100-watt light bulb lit for several short minutes. That humbling revelation made him appreciate nuclear power plants, which produce gargantuan numbers of watts continuously for hundreds of days at a time, all the more. The Harvard Business Review looked at the the Spacex process for lowering the cost of space. Spacex has a big goal, learned from the past, looking at the whole picture to find and prioritize opportunities, then refining key aspects of the space flight model to achieve their objective — is an approach that can make any organization more creative about cutting costs. SpaceX approach innovates and transforms by looking at the entire business model instead of the parts. Cuts weren't just made to the physical rocket itself but to everything surrounding it — overhead, support services, development time frame, and more. Nextbigfuture looked at where the Spacex approach is being applied in energy. Each 300 MW thermal MSR would generate $1 billion per year in oil revenue from the oilsands. A 300 MW thermal reactor would be the same as a 100 MW electrical reactor. Even if costs were as much proportionally as a $10 billion 1 GWe conventional nuclear reactor (the high costs of the most expensive European or US projects.) the $1 billion cost would be recovered in about 2-4 years. Also, they indicated that there is no turbine to produce electricity since only steam is used. So the costs should be $700 million max. This profitability means that the first 200 units should easily be profitable. Usually making more units has a improvement rate in lowering costs by a few percentage points for each later unit. The oilsand units would also generate the money to help payoff research and development costs, which would initial come from oilsand taxes and oilsand partners. Nextbigfuture calculates that the IMSR could get down to 0.86 cents per Kwh. Japanese High Court does Right Thing for Wrong Reason. A high court in Japan has rejected the demands of a few Fukushima parents to evacuate tens of thousands of not-at-risk children to other parts of Japan. The court said there was no legal precedent for it. However, they should have used recent scientific reports on the good health of Fukushima children as their reason. That's it for this week's Carnival entries. All that's left is to answer the question -- what was that picture at the top of this post? 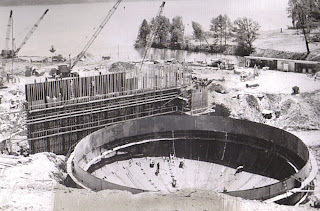 The photo (and that above) are June 21, 1962 photos of the initial construction phases of the Peach Bottom Atomic Power Station, located in Peach Bottom Township, York County, Pennsylvania, along the Susquehanna river. These photos were provided to the press by Philadelphia Electric Company. Peach Bottom 1, as it's now known, was an experimental high-temperature gas cooled reactor rated 115 MWt / 40 MWe and which was built under the third round of the AEC "Power Demonstration Reactor Program." The reactor plant vendor was the General Atomics Division of General Dynamics Corporation (usually referred to just as "General Atomics" or just GA) and the engineer and construction contractor for the plant was Bechtel Corporation. Here is a brief history. Philadephia Electric was involved early with nuclear energy, taking part from 1952 in what became the Enrico Fermi Atomic Power Plant. 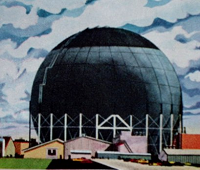 The company formed HTRDA, or High Temperature Reactor Development Associates along with 52 other utilities to research and develop high temperature designs, which culminated in a November 1958 proposal to the AEC to build a new design of General Atomics helium-cooled reactor. 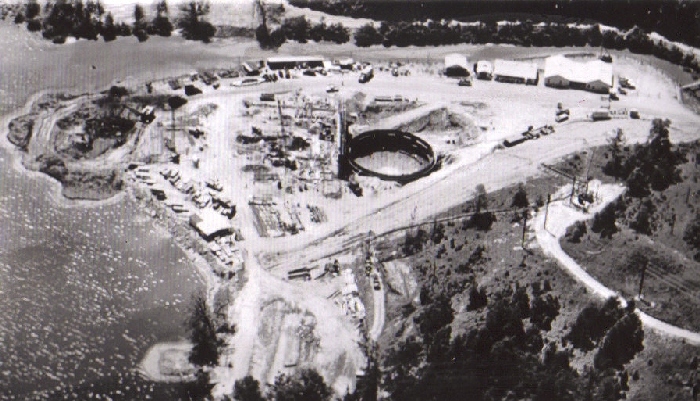 The Joint Committee on Atomic Energy approved the project proposal in June 1959, and in August 1959 contracts were signed to build the plant at the location shown above. The construction permit was issued in February 1962 (Permit No. CPPR-12) - and you can see the progress by comparing the unspoiled site illustration (from a Peach Bottom souvenir brochure) and the June 1962 photos. Below, artist's conception of the plant as designed. The 14 foot diameter, 35-1/2 foot high carbon steel reactor vessel arrived on site in January 1964, and the fuel arrived one year later. Another year later -- January, 1966 -- a low power operating license was granted so that fuel loading could commence the following month. February 1966 -- Start of Fuel Loading. March 1966 -- Initial Criticality. The core for this reactor contained 804 fuel elements, which as fuel contained both 93% enriched uranium carbide and thorium carbide dispersed in graphite pellets. 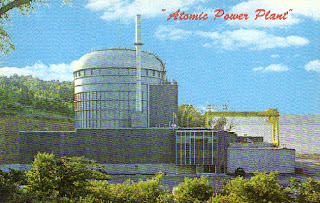 The reactor plant was designed to load follow at a rate of 3%/minute down to 30% power - and after final shutdown of the plant, Philadelphia Electric reported that the plant had in fact operated in the load following mode for the majority of its seven year operating time frame. The helium coolant entered the core at 660F and exited at 1380F. This allowed the plant to produce steam at 1450 PSIG and 1000F. 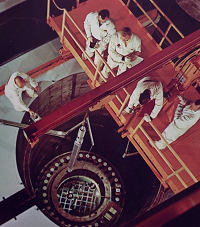 Operation was essentially as planned; however, the fuel elements began to develop cracks in 1969, and while activity released to the helium coolant was minimal, the decision was made to refuel the reactor with improved elements whose design eliminated or reduced the chance of such cracking. This second core first started up in July, 1970. 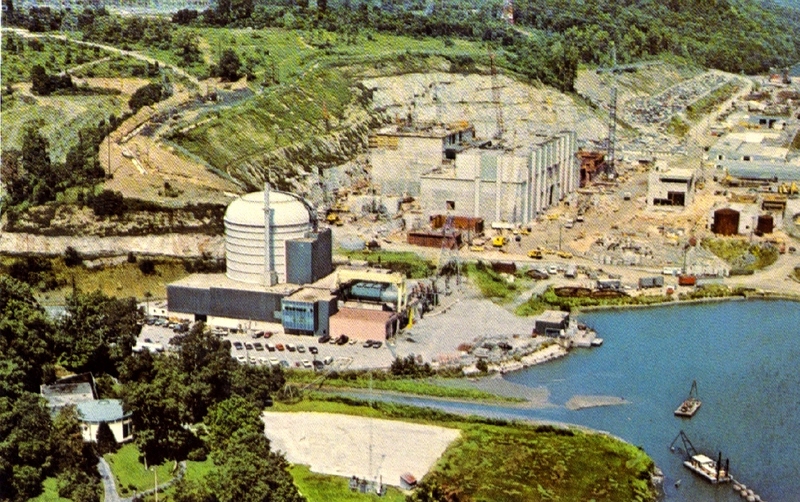 The experimental nature of the plant and its small size led to the decision to shut it down permanently, which occurred in October 1974 at the second core's end-of-life. There was just not economic support for a 40 MWe prototypical nuclear plant in the vastly expanding Philadelphia Electric system. Plans were made to replace it. The HTGR as a concept did not continue in the Eastern U.S. 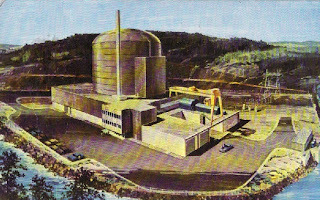 While there was an initial attempt to build a further, developed HTGR at what became the site of the Ginna Nuclear Station, the decision was made to build a PWR there instead. 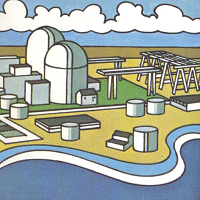 The next-generation HTGR was, in fact, built - but as the Ft. St. Vrain nuclear station, out West. The site of the Peach Bottom Atomic Power Station was not destined, though, to become a footnote to nuclear energy history. Two much more powerful General Electric BWR units were built on a much expanded site footprint. 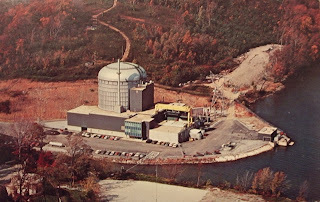 Below, we see Peach Bottom Units 2 and 3 under construction beyond the original unit and its Visitor Center (lower left corner of photo). 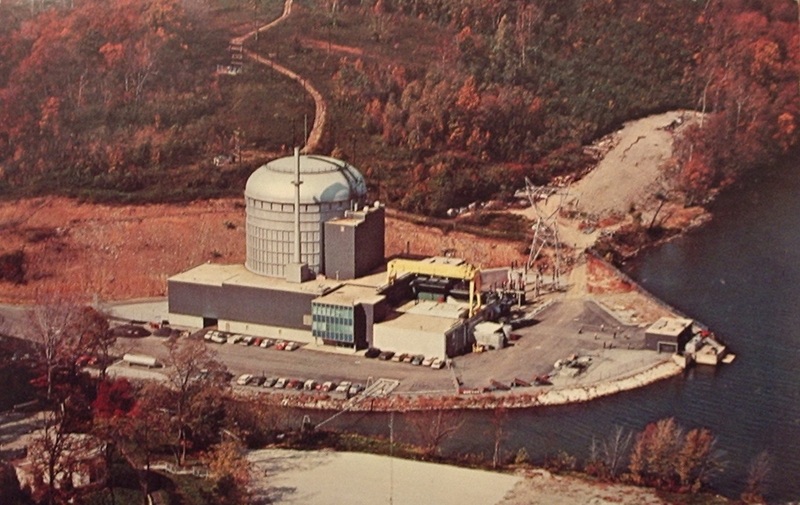 The plant, in York County, Pa., was shut down in October 1974 and is in SAFSTOR with no significant dismantlement underway. Active decommissioning of Unit 1 is not expected until 2034, when Units 2 and 3 are scheduled to shut down. 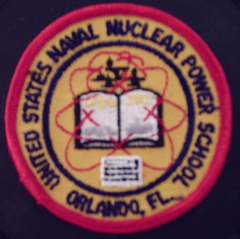 The PSDAR public meeting was held on June 29, 1998. The spent fuel has been removed from the site and is stored at the Idaho National Laboratory. I hope you've enjoyed the 154th Carnival and the look back at Peach Bottom 1. Thanks for visiting! Illustrations from Will Davis collection. 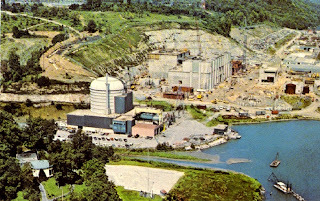 Source material includes "Peach Bottom Atomic Power Station" by Philadelphia Electric Company, "The Atomic Energy Deskbook," Hogerton / Reinhold Publishing 1963, and "Final Summary Report on the Peach Bottom End of Life Program," K. P. Steward - General Atomic Company July 1978. Friends, a new petition has been placed on the White House petition website, whose intended purpose is to raise awareness of how damaging the LNT (Linear No Threshold) model of radiation effects is to the accomplishment of ... well... anything useful at all. You can check out the petition and sign it here. You'll need an account to sign it, but that only takes a moment with brief signup and then a confirmation e-mail. Let's get rid of this all-too-highly-conservative assumption that cripples our ability to make the greatest possible use of nuclear technology. We who have been certified to work in radiation environments (and I was for years) know very well that there are NO effects to the body if the exposure is kept within the Federal limits. We also know that these limits used to be much higher.. and there's no proof that there was any problem back then either. It's time to get fear out of the equation, and replace it with evidence and knowledge -- and ditching LNT will do just that. Press release April 15, 2013 from B&W follows. (CHARLOTTE, N.C. – April 15, 2013) – The Babcock & Wilcox Company (B&W) (NYSE: BWC) announced today that its subsidiary, Babcock & Wilcox mPower, Inc. (B&W mPower), and the U.S. Department of Energy (DOE) have signed a Cooperative Agreement for funding made available through DOE’s Small Modular Reactor (SMR) Licensing Technical Support Program for the development and licensing of B&W’s mPower™ technology. The $79 million allocated for the first year of the program will be immediately available to the B&W mPower program. While the DOE has projected that approximately $150 million will be made available during the five-year period of the DOE award, subject to incremental appropriations from Congress and B&W mPower’s compliance with the terms of the Cooperative Agreement, the Cooperative Agreement allows for $226 million or more in federal funding. B&W mPower intends to use any additional funding made available on a cost-shared basis for licensing and engineering activities that qualify under this award. The signing of the Cooperative Agreement formalizes B&W’s cost-share agreement with DOE, following the selection of the mPower America team – comprised of B&W, the Tennessee Valley Authority (TVA) and Generation mPower – as the winner of DOE’s competitively bid funding opportunity, in support of commercial demonstration of the B&W mPower SMR by 2022. B&W mPower and Bechtel (who together formed Generation mPower LLC) will provide licensing and engineering support for the mPower America Project. The first key step for the mPower America Project was achieved in February when B&W mPower and TVA signed a contract to prepare and support the Nuclear Regulatory Commission review of a Construction Permit Application for a B&W mPower nuclear plant at TVA’s Clinch River Site. With the signing of the Cooperative Agreement, geological characterization studies will commence at the Clinch River Site within approximately six weeks. The mPower America team will also develop a Preliminary Safety Analysis Report, a Design Certification Application for the mPower Plant and a Construction Permit Application for up to four mPower SMR units. The B&W mPower reactor is an advanced integral pressurized water reactor designed to generate 180 MW of electricity. The reactor incorporates technology innovations which advance the state-of-the-art in nuclear plant safety, security and economics. The Tennessee Valley Authority is a corporate agency of the United States that provides electricity for business customers and local power distributors serving 9 million people in parts of seven southeastern states. TVA receives no taxpayer funding, deriving virtually all of its revenues from sales of electricity. In addition to operating and investing its revenues in its electric system, TVA provides flood control, navigation and land management for the Tennessee River system and assists local power companies and state and local governments with economic development and job creation. www.tva.gov. Bechtel is among the most respected engineering, procurement, and construction companies in the world. It stands apart for its ability to get the job done- no matter how big, how complex, or how remote. Bechtel is built upon time-tested values of excellence and integrity. The reliability of its performance, the enduring quality of its projects, the strength of its ethics, and the seriousness of its commitment to safety and sustainability, are evident in everything it does. For more information about Bechtel visit www.bechtel.com. B&W cautions that this release contains forward-looking statements regarding the B&W mPower program and the Cooperative Agreement, to the extent such statements relate to management’s plans and expectations regarding the commercialization of the B&W mPower reactor and receipt of DOE funding under the Cooperative Agreement. These forward-looking statements involve a number of risks and uncertainties, including, among other things, our inability to finance B&W mPower research and development efforts, the availability of continued DOE funding under the Cooperative Agreement, B&W mPower’s ability to comply with the terms of the Cooperative Agreement, adverse changes in the demand for or competitiveness of nuclear power and changes as a result of regulatory oversight by the Nuclear Regulatory Commission or other U.S. Government agencies. If one or more of these or other risks materialize, actual results may vary materially from those expressed. For a more complete discussion of these and other risk factors, please see B&W's filings with the Securities and Exchange Commission, including its annual report on Form 10-K for the year ended December 31, 2012 and subsequent quarterly reports on Form 10-Q. B&W cautions not to place undue reliance on these forward-looking statements, which speak only as of the date of this release, and undertakes no obligation to update or revise any forward-looking statement, except to the extent required by applicable law. As of this morning, there has been exceedingly little new information released about Sunday's industrial accident at ANO Generating Station. The briefest timeline follows. While workers were moving a roughly 500 ton piece of equipment from its installed location to the transport bay in the center of the ANO turbine building, the crane or lifting rig being used to move the equipment collapsed. The piece of equipment, a turbine stator, fell down to the floor of the transport bay, resulting in one death and eight injuries. Damage resulted to both electrical equipment and to a fire main, with a number of results which affected plant operations. Later, water from the fire main caused some AC power at Unit 2 to fail, but when that occurred (about two hours after the crane failure) the emergency diesels automatically started. Both reactors are shut down safely. (One already had been before.) NRC and OSHA are on site with Entergy officials, as reported in yesterday's press. There are inside reports of structural damage to the (very large) support structure for Unit 1's turbine generator. (A nuclear plant's turbine generator can be over 225 feet long and weigh over 5000 tons completely assembled; the support structure is even larger and heavier.) None of those has been either confirmed or denied by Entergy -- or for that matter even acknowledged. -What is the condition of the survivors? Will all recover fully? -What is extent of damage to Unit 1's turbine generator support? -Is the Unit 1 replacement stator on site? -What is extent of damage to equipment related to Unit 2 .. and can Unit 2 expect an extended forced outage as a result of this incident? -Will the industry enforce a "heavy lift safety stand-down" to review lift procedure, equipment integrity, and equipment testing? Follow here, and on Twitter ( @atomicnews ) for further updates. Background news links below. 2:00 PM The Pope County Coroner has officially identified the worker killed at ANO over the weekend (even though the identity was already fairly widely known.) Wade Walters, of Russellville Arkansas was killed at the scene of the industrial accident at ANO on Sunday. Click here. PHOTOS of the industrial accident have now begun to circulate fairly widely around the internet. They are appearing on approximately five known websites at this time. Here is a link to one. The photo page above contains a link to where the PROS apparently found the photos; that original page is seen at this link. The following link will lead to a Platts story covering OSHA having dispatched a team to the Arkansas Nuclear One site. Thanks to Atomikrabbit for the tip on this additional angle. The NRC's blog has clarified the situation of the shutdown of Unit 2 somewhat. Apparently the damage caused by the generator stator falling, and damaging electrical equipment, led to loss of a reactor coolant pump on Unit 2 while at 100% power. This then resulted in a power to flow reactor trip (scram.) Further, within two hours after the industrial accident, water coming from a broken fire main shorted out a breaker supplying one electrical bus to Unit 2, resulting in EDG (Emergency Diesel Generator) auto-start. 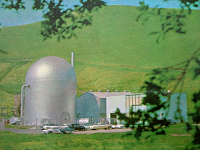 ROSEMEAD, Calif., April 1, 2013 — Southern California Edison (SCE) has voluntarily submitted a draft license amendment request to the Nuclear Regulatory Commission (NRC) for discussion. The draft is designed to support safely restarting Unit 2 of the San Onofre Nuclear Generating Station to address customer electricity demand and grid reliability concerns during the upcoming summer months. SCE is considering submitting a final amendment request after discussing it with the NRC staff at a public meeting Wednesday in Rockville, Maryland. The draft license amendment request, if finalized and submitted for NRC approval, would support SCE’s plan to operate Unit 2 at 70 percent power for five months. Operating at 70 percent power prevents conditions that caused the tube-to-tube wear in Unit 3 that resulted in the nuclear plant being shut down since January 2012. SCE and three independent companies with expertise in nuclear generation have confirmed it is safe to operate the Unit 2 steam generators. The NRC has been evaluating these analyses, which are based on exhaustive testing and inspections, since October 2012. SCE would be asking the NRC to act on the amendment before the end of May to facilitate timely restart of Unit 2 to meet peak summer electricity demand. Following the initial five-month operating period, SCE would shut down Unit 2 for steam generator tube inspections. Based on inspection data, Unit 2 would resume operation at 70 percent power for an appropriate operating period during the remainder of the 18-24 month fuel cycle while SCE updates its analysis to determine the appropriate long-term power level. The San Onofre nuclear plant is the largest source of baseload generation and voltage support in the region and is a critical asset in meeting California’s clean energy needs. According to testimony filed by SCE for its General Rate Case and as part of a report prepared in 2010 by IHS Global Insight, operating the nuclear plant directly generates economic activity worth on average $2.2 billion per year. The impact grows to $3.3 billion per year if secondary economic effects are considered, which include the supply chain purchases of businesses supported by the nuclear plant and spending by those employed by the plant. Both units at the San Onofre nuclear plant are currently safely shut down. Unit 2 remains shut down since it was taken out of service Jan. 9, 2012, for a planned outage. Unit 3 was safely taken offline Jan. 31, 2012, after station operators detected a leak in a steam generator tube. More information is available at www.edison.com/SONGSupdateand at www.SONGScommunity.com. San Onofre is jointly owned by SCE (78.21 percent), San Diego Gas & Electric (20 percent) and the city of Riverside (1.79 percent). Follow us on Twitter (www.twitter.com/SCE) and like us on Facebook (www.facebook.com/SCE). Below is the Event Report from the NRC website. "At 0750 [CDT] on 3/31/2013, during movement of the Unit 1 Main Turbine Generator Stator (~500 tons), the Unit 1 turbine temporary lift device failed. This caused a loss of all off site power on Unit 1. The ANO Unit 1 #1 and #2 EDG [Emergency Diesel Generator] have started and are supplying A-3 4160V switchgear and A-4 4160V switchgear. P-4A Service Water pump and P-4C Service Water pump has been verified running. Unit 1 has entered [procedures] 1202.007 - Degraded Power, 1203.028 - Loss of Decay Heat, and 1203.050 - Spent Fuel Emergencies. Unit 1 is in MODE 6. "ANO-1 entered TS 3.8.2 A, 'One Required Offsite Circuit Inoperable'. All required actions are complete. The event caused a loss of decay heat removal on ANO Unit 1 which was restored in 3 minutes and 50 seconds. "Unit 2 tripped and is in MODE 3. Emergency Feed Water was initiated on Unit 2 and Unit 2 was in [Technical Specification] 3.0.3 from 0817 [CDT] to 0848 [CDT] due to Emergency Feedwater. Unit 2 is being powered by off-site. Unit 2 Startup 3 [transformer] lock out at 0921 [CDT]. [Bus] 2A1 is on Start up 2 [transformer] and [bus] 2A3 is on #2 EDG. "10CFR50.72 (b)(3)(iv)(A) - 4-hr. notification due to the ES [Engineered Safeguard Feature] actuation on both Unit 1 and Unit 2. 10CFR50 72 (b)(2)(iv)(B) - 4-hr. notification due to RPS [Reactor Protection System] actuation on Unit 2. 10CFR50.72 (b)(2)(xi) - 4-hr. notification due to Government Notification. 29CFR1904.39a - [OSHA] 8-hr. notification due to death on site. "At 1033 [CDT] on 3/31/2013, Unit 2 entered a Notification of Unusual Event based on EAL HU4 due to damage in 2A1 switchgear. Notification of the NUE will be made lAW Emergency Plan requirements. Follow-up notifications will be made as appropriate." At this time, the full extent of structural damage on Unit 1 is not known. There was one known fatality and 4 known serious injuries to workers. The local coroner is on site for the fatality and the injured personnel have been transported offsite to local hospitals. Investigation into the cause of the failure and extent of damage is ongoing. On Unit 2, all rods inserted during the trip. The core is being cooled via natural circulation. Decay heat is being removed via steam dumps to atmosphere. There is no known primary to secondary leakage. The licensee has notified the State of Arkansas, local authorities, OSHA and the NRC Resident Inspector. Notified DHS SWO, DHS NICC, FEMA and Nuclear NSSA (via email). The licensee terminated the NOUE at 1821 CDT. The basis for termination was that the affected bus (2A2) is de-energized and no other equipment on Unit 2 was damaged. The licensee has notified the state and local authorities and will be notifying the NRC Resident Inspector. Notified R4DO (Pick), NRR EO (Howe), IRD (Gott), DHS SWO, DHS NICC, FEMA and Nuclear SSA (via email).